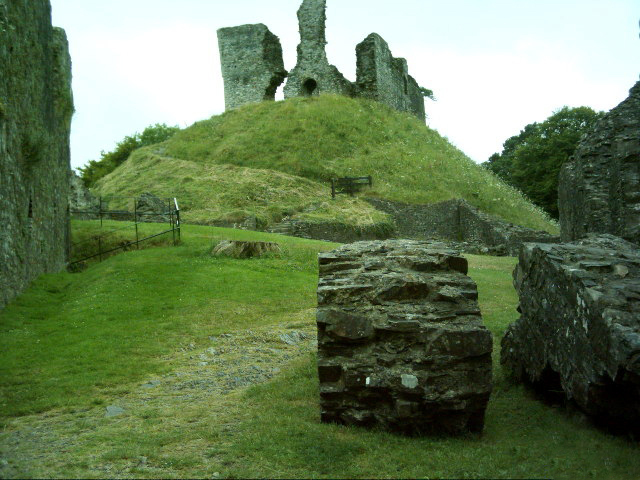 Notes: Okehampton Castle is a medieval motte and bailey castle in Devon, England. It was built between 1068 and 1086 by Baldwin FitzGilbert following a revolt in Devon against Norman rule, and formed the centre of the Honour of Okehampton, guarding a crossing point across the West Okement River. It continued in use as a fortification until the late 13th century, when its owners, the de Courtenays, became the Earls of Devon. With their new wealth, they redeveloped the castle as a luxurious hunting lodge, building a new deer park that stretched out south from the castle, and constructing fashionable lodgings that exploited the views across the landscape. The de Courtenays prospered and the castle was further expanded to accommodate their growing household. The de Courtenays were heavily involved in the 15th century Wars of the Roses and Okehampton Castle was frequently confiscated. By the early 16h century the castle was still in good condition, but after Henry Courtenay was executed by Henry VIII the property was abandoned and left to decay, while the park was rented out by the Crown. Parts of the castle were reused as a bakery in the 17th century, but by the 19th century it was completely ruined and became popular with Picturesque painters, including J. M. W. Turner. Renovation work began properly in the 20th century, first under private ownership and then, more extensively, after the castle was acquired by the state. In the 21st century it is controlled by English Heritage and operated as a tourist attraction.